(1) How the head rules the heart!! Mathematically modelling central cardiovascular control, with various techniques including Heart Rate Variability Analysis (HRV), Bayesian statistics and Deep Learning In vitro studies of the properties and modulation of ion channel currents in the PVN, especially those of neurones involved with the cardiovascular response to psychological stress, temperature circadian rhythm and osmolarity. For a very general explanation, see below. This is important for both human and veterinary medicine. I also have a few projects running on the very peculiar pharmacology of chondrocytes. 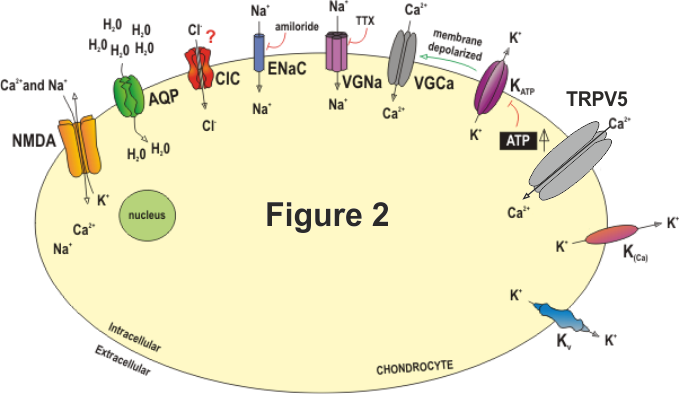 What are all their ion channels for (!? ), are they involved with the pathogenesis of arthritis? We find that the ion channels of chondrocytes have two linked functions in the control of cellular volume: (a) they act as “osmolyte” channels as proposed by others many years ago (Bush, Hall, Wilkins, Ellory and others (sorry if I misquote)). (b) They (naturally) set the membrane potential, which is, in turn, vital to the control of volume (see below). 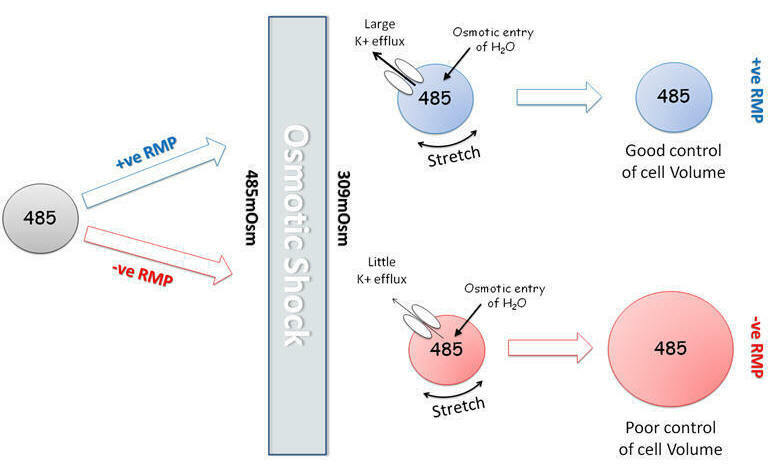 We think pharmacological control of chondrocyte volume could be important for modifying the progression of OA. Watch this space! Next is the overall scheme, lots of this comes from Guilak. Nuki, Salter, Stockwell and Wright and showed many years ago (early mid 1990’s) that the membrane potential of chondrocytes is way more positive than “normal” cells, but many others have since suggested that this is not the case. We find similar to the original work by Nuki, Salter, Stockwell and Wright. Below is why the (relatively) positive membrane potential is so important. How did people miss this for so long!? (At review; one reviewer said this is nonsense, the other said this is obvious! That’s the thrill of science!!). Please cite Lewis et al 2011 if you use this. A PhD place for home UK/EU students is currently available. Please feel free to contact me! Projects are as above: Ion Channel function in connection with cardiovascular control and musculo-skeletal system. Otherwise, if you are interested in PhD opportunities and if you have your own funding (BIG catch), let us know! Vet Students: Sorry, I keep most stuff locked up under VITAL, for registered students only! Except for a few links. Single-channel and whole-cell patch-clamp electrophysiology. We use this software. Mathematical modelling of cell function. How the Head Rules the Heart. Question: Why the British Heart Foundation (BHF) interest? Answer: For very good reasons. The head really does rule the heart! Several neural outputs from the brain (largely the medulla) project to the heart and blood vessels. These neural pathways control or influence the normal and pathophysiological behaviour of the circulatory system. Disturbances of this control can result in diseases of the cardiovascular system, such as hypertension. Less commonly known is another group of neurones which project from the hypothalamus (specifically the PVN) directly to sympathetic pre-ganglionic neurones in the spinal cord (e.g., neurones which modulate the cardiovascular system). Our belief is that sudden stress could result in the activation of these neurones, with potentially, serious consequences. This BHF funded project is looking into the cellular mechanisms by which chemical stress factors could activate these neural pathways. When we understand how and why these neurones become active, we can think about how we could intervene to allow normal activity, but prevent abnormal, and dangerous activation of this pathway. I am also now Chair of the Physiological Society’s Benevolent (Hardship) Fund.